Audi has staked its racing reputation on the famed race held at the Circuit design Sarthe. The race highlights the brands famed TDI engine and Quattro all wheel drive technology. Audi’s most recent entry is a V6 diesel powered hybrid electric racer. The vehicle uses two electric motors producing 218 hp to power the front wheels. Energy to power the electric motors is stored in a flywheel that sits next to the driver. The rear wheels are powered by a 490 hp V6 turbo diesel engine. With the departure of Peugeot 2 years ago, Toyota has joined the series with a pair of diesel electric hybrids. Under a menacing sky 56 race cars began the most famous endurance race on the planet. This year’s event was the the 81st running of the 24 Heures du Mans. 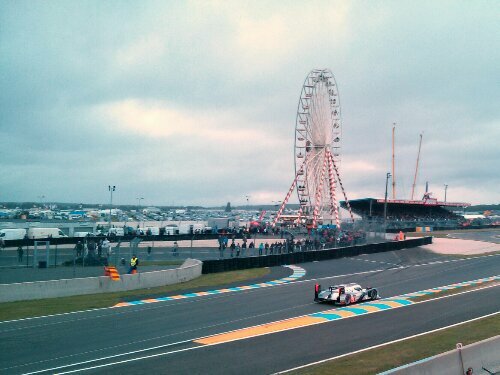 The Audi trio of cars started first second and third on the grid with the 2 Toyotas right behind. A light rain was falling as the cars began racing. The Toyota began a hard charge moving initially up to positions 2 and 3. Audi representatives were overheard expressing some surprise at the new found pace compared to the qualifying times. One explanation offered was the fact rain had played a significant role in disrupting qualifying. All the same, Audi reps maintained the position that this was an endurance event and it would take 24 hours of racing to unfold. A mere 3 laps in the race, one of the Aston Martin Vantage cars driven by Allan Simonsen crashed at high speed. Simonsen was treated and transported to the onsite medical centre where he was pronounced dead. The resulting track repairs resulted in a safety car being on track for almost a full hour. When racing resumed the Audi resumed its dominance and some six hours into the contest the three R18 E-trons remain at the front of the field with the two Toyotas directly behind. We will be filling up throughout the race with further updates.